A significant model in the history of electric guitars since its birth in 1954, the Fender Stratocaster is still a huge favourite. Offering top quality, flawless tones, the 2017 American Professional Stratocaster HSS Shawbucker has been designed to pull together the best features of a classic and a modern Strat for a versatile sound. The American Pro has a solid alder body which contributes to the typical timbre of a Fender Stratocaster. The body is treated with a gloss polyurethane layer, protecting the colour and natural grains of the tonewood. 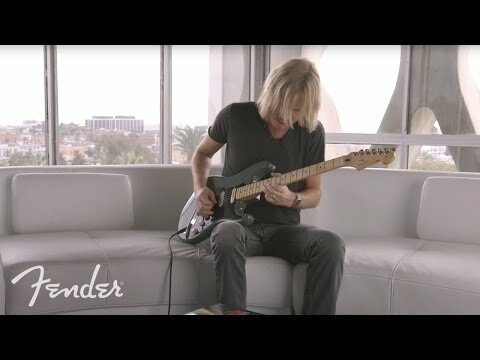 One of the most noticeable features of a Fender Strat is its unique shape, and this is the same with the American Pro model, keeping the traditional double cutaway body profile. This allows the player to access every single fret on the neck, even the higher registers, with complete freedom. For an effortless playing feel, Fender have joined a smooth maple neck to the American Professional Stratocaster. The 25.5 inch scale length neck is shaped to the new Modern "Deep C" profile. Aboard the neck is also a 9.5 inch radius luxurious maple fingerboard which is home to 22 narrow-tall frets adorned with black dot inlays. Each fret provides plenty of space to perform precise string bends and chords with confidence. Fender have selected three powerful pickups which consist of Tim Shaw's innovative yet vintage V-Mod Single-Coil Strat pickups in the neck and middle, joined by a single Shawbucker 1 pickup in the bridge position. The dual single-coil pickups give you that unparalleled Fender Strat tone, while the addition of a Shawbucker 1 humbucker pickup gives you an extra sonic richness for a full-bodied, beefier tone. Each pickup has been explicitly voiced to enable them to provide their own unique range of tones, and are powered by various alnico magnets. Two tone controls are joined by a Master Volume with Treble-Bleed control for an even better output thanks to the dual 250K/500K volume potentiometer. A 5-way pickup switch blade allows you to easily tweak your tone to suit your playing needs. A 2-point synchronised tremolo bridge with bent steel saddles and a pop-in tremolo arm is fitted to the lower bout of the body for those breathtaking dives and wails that have been so well-known over the years thanks to a myriad of famous Fender guitar players. The Stratocaster headstock is fitted with Fender standard cast/sealed staggered tuning machines which uphold tuning integrity with outstanding accuracy, further enhanced by the addition of a bone nut. Nickel/chrome hardware and a pickguard complete the American Professional Stratocaster for a neat visual aesthetic. Fender supply an Elite molded case to protect, store and carry the guitar safely.